Dhokha khana to mohabbat walo ki ek rasm-E-wafa hai. Phool khushi ke liye hota to log janaaze pe na dalte. Humne to mohabbat ke nashe me use khuda bana diya. Hosh to tab aaya jab usne kaha ki khuda kisi ek ka nahi hota.. If 2day is world STEALING DAY wat wud U Steal frm me...... Reply is a must!!! 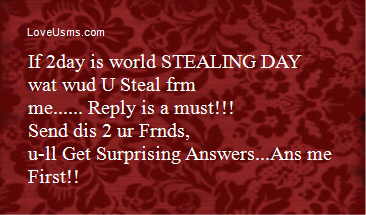 Send dis 2 ur Frnds, u-ll Get Surprising Answers...Ans me First!! snd it to ur frndz n get funfilled n amazing answers..
Tell me 1 moment when you were really impressed by me. Imagine dt U met me on d road unxpctdly, den u rmmbr dt 2dy is my b-day, but u hv no money. but u want 2 gv me a gift. 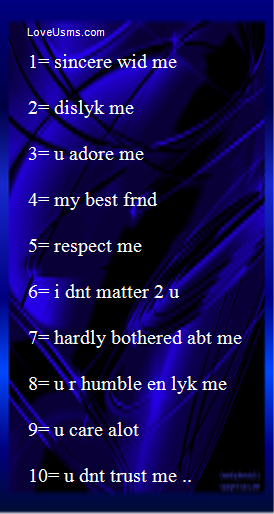 wat wud u gv..
dan i-ll tell wot are ur feeling abt me ..
10= u dnt trust me ..